Getting a new metallic knee and a big surgery can be very overwhelming. It is particularly hard right after the surgery! 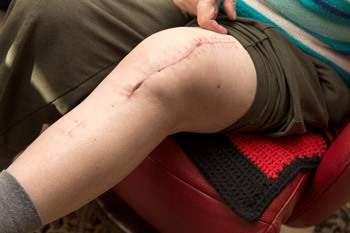 Here you will find some Recovery Tips: Total Knee Replacement. These can help with faster recovery. During the first few days following the surgery, you are at risk of developing a clot in your calf. This is because as you are not moving much due to pain or from the effect of anesthesia. Simple foot/ankle exercises will prevent pooling of blood around your calf leading to a possible clot. Registered Physiotherapists Mississauga can help to manage your pain and swelling right after the surgery. Many surgeons recommend providing compression to the area using a compression stocking. They also recommend using ice around your knee joint. Its usually done with your leg elevated so that gravity can further help to drain the swelling around your knee. As part of your home exercises, pumping your ankle up and down is advised. It is also recommended to avoid keeping your knee in a position such as prolonged sitting with your feet dangling in the air. This can cause your knee to swell more. Registered Physiotherapists Mississauga might use electrical stimulation(IFC) to further help with draining of the fluid in your knee joint. Electrical stimulation helps to stimulate muscle contraction around your knee joint which helps to drain the fluid from your knee joint. Yes, there are many ways to control the swelling around your knee joint and Registered Physiotherapists Mississauga at all of our PhysioNow locations can assist in your road to recovery following Total Knee Replacement. Exercise remains the key way to achieve a faster recovery following total knee replacement. Registered Physiotherapists Mississauga will provide an exercise program for your knee so that there is less stiffness setting in around your knee. Also, exercise will prevent your muscles from shrinking or weakening following surgery. A Knee slider board can be helpful to keep the knee moving through the full range in a more comfortable way. PhysioNow has knee slider boards available for rent after your knee surgery. Please call PhysioNow today to reserve a board for after your surgery.